I'd say it was inevitable that two very succesful albums of a series would be eventually followed by the third installment that would complete a trilogy, a number quite popular in entertainment ever since Star Wars. Bat Out Of Hell III hit the shelves not long ago, after some legal tussles between writer-maestro Jim Steinman and Meat Loaf, as Steinman didn’t want to be involved in this project. But as his songs were used, so a permit had to be gotten outside of court, and the record finally did come out on Halloween. 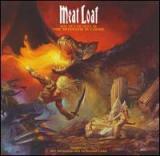 A Meat Loaf Album without the full participation and supprt of Steinman sounds risky to say the least. The attempt was bold to make it work without him though, as power rock writer/producer supreme Desmond Child was brought in to do the job an write some hits. The album gets off to a surprisingly metallic start with the dark riffing of The Monster Is Loose. I’m not that surprised that John 5 of formerly Marilyn Manson’s band is the guest guitarist here as the rocking is very modern-tinged and kind of off-beat for a Meat Loaf-album. Hearing Loaf going almost into rapping-mode with the vocals is weird to say the least. The interlude goes into nicely melodic moods that sound more like it. Still, despite all the string arrangements and heavy arrangements I’m not that convinced with the track. Blind As A Bat is just on par with normal radio rock-tunes and not anything better. Two tunes into one of my favourite artists new record and no gems? It’s All Coming Back To Me Now is then again a classic Loaf-ballad that explodes with drama and cheesiness that melt into an awesome package. Questing duet partner/stunner Marion Raven has a nice set of pipes and is a good contrast to Meat’s bellowing timber. Of course this is a rerun of the vocal-duelings on first two albums, but that’s why it also works so well. I think I’ve heard this song before and it was done by Celine Dion. Well, this one blows that version out of the water. Bad For Good, a song off Jim Steinman’s first solo record, is next and it’s about Meat covered this diamond of a overblown rocker himself, as it should’ve been like that already in the 80s. Brian May of Queen-fame is guesting with his trademark guitar sound, bringing the probably two greatest elements of pompous rock in history together to close a circle of sorts. This opening foursome shows all too well how the songs penned by Steinman (such as It’s All Coming Back and Bad For Good) are just the better majority of this album. Child and guesting hit-makers have a couple of home runs with tracks like Alive, a magnificent mid-tempo rocker with one hell of a chorus and gang-choruses to the heavens, and Cry Over Me, another ballad that let’s Meat pour on the syrup like only he can. But flaccid tunes like If God Could Talk and What About Love just are not on par with the quality associated with Meat Loaf. You can’t really blame them, as they are trying to patch up the unity of a song writer-performer-partnership that produced one of the greatest albums in history and an A-bomb –level sequel to it. They just don’t have the history and experience that Steinman and Loaf have. And I must say, even the best tracks of the new songwriters are mostly saved by the third member of the original BOOH-creating triad, Todd Rundgren. His bloated and über-melodic vocal arrangements harmonize this album in the level of greatness that it possibly can with the uneven song material. Steinman’s pen flashes some more in the process. The Land Of The Pigs, The Butcher Is King is another heavier burner that has Steve Vai pulling off some awesome solos. If It Ain’t Broke, Break It is probably my favourite track off the record with the groovy horn section, rollicking hard rock-tempo and rowdy chorus that demands fists flying. Eric Sardinas guesting on the slide guitar just adds to the prominent gritty groove that is destructive! The Future Ain’t What It Used To Be is a gospel-style ballad with even some country-leenings but it gells together like all hell. The strong choirs back up Loaf and the guest vocalist Jennifer Hudson into the heavens and the emotion is there again. The main problem here just is that the outside songwriters don’t match up to Steinman’s signature completely-over-the-top style of tunes that Meat Loaf made classics. Their input is half-hearted, radio-minded material, that is made just that much better by the delivery and excecution. More pomp, more twists, more humour, more of everything would be necessary here. But instead of creating the grandeur in the songs, they just picked enough bignamed-guest stars and hoped it would do. So while Bat Out Of Hell III - The Monster Is Loose is a great record and worthy predecessor to the first two masterpieces, it does not reach to the same level.